Drought by Pam Bachorz. Grades 7+. Egmont USA, January 2011. 392 pages. Reviewed from ARC provided by publisher. For the past 200 years, Ruby has been part of the Congregation, an enslaved religious group that's forced to spend their days harvesting dew from the leaves in the forest to make Water. Water is the key to everything - healing and the Congregants' long lives - but very few know the secret: it's Ruby's blood that gives the Water its special properties. Ruby's father Otto founded the Congregation and he left 200 years ago, promising to return. The Congregants wait for him, trusting that he's coming back to save them. But when a new, kind Overseer named Ford arrives and sparks new feelings for Ruby, she starts to question everything. What if Otto's not coming back? What if Otto meant for them to save themselves? When flighting or fleeing might mean the death of all the Congregants, Ruby has to decide how much she's willing to risk. The utterly compelling and twisted world of the Congregation was what drew me into this novel. I just had to know more about them and the more I read, the more fascinated I was. I kept looking for holes, certain that I'd come across a simple way for Ruby to extricate herself from this warped community, but I found everything to be believable. Although there's a modern world out there, beyond the forests, the Congregants are a people enslaved. Physically they've been enslaved by Darwin West and his band of Overseers since 1812, but the Congregants are also enslaved by their own doctrine, believing that Otto, giver of life, wants them to wait for him, to sustain, to endure. I found Ruby to be a believable protagonist, caught between her desire to fight for freedom and her obligations to her fellow Congregants. Without her, they'll die. If she fights or runs away, she's doesn't only risk her own life, she risks their lives as well. Once Ford arrives and presents her with some new options, Ruby starts to realize that the people she's trusted her entire life might not be what they seem. 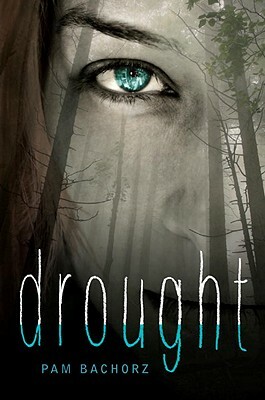 Drought is a tightly woven dystopian novel that'll keep teens on the edge of their seats, rooting for Ruby to the last. It's a great follow-up to Pam Bachorz's first novel, Candor (Egmont USA, 2009), and I'd hand either of them to fans of dystopian lit like Ally Condie's Matched (Dutton, 2010) or Suzanne Collins' The Hunger Games (Scholastic, 2008). Check out more reviews at A Patchwork of Books, The Neverending Shelf, and Mindful Musings. Drought will be on shelves January 25!